I'd love for you to meet Andy Tabar. He went from omnivore to vegan within eight months, and then kind of fell into creating his own business. 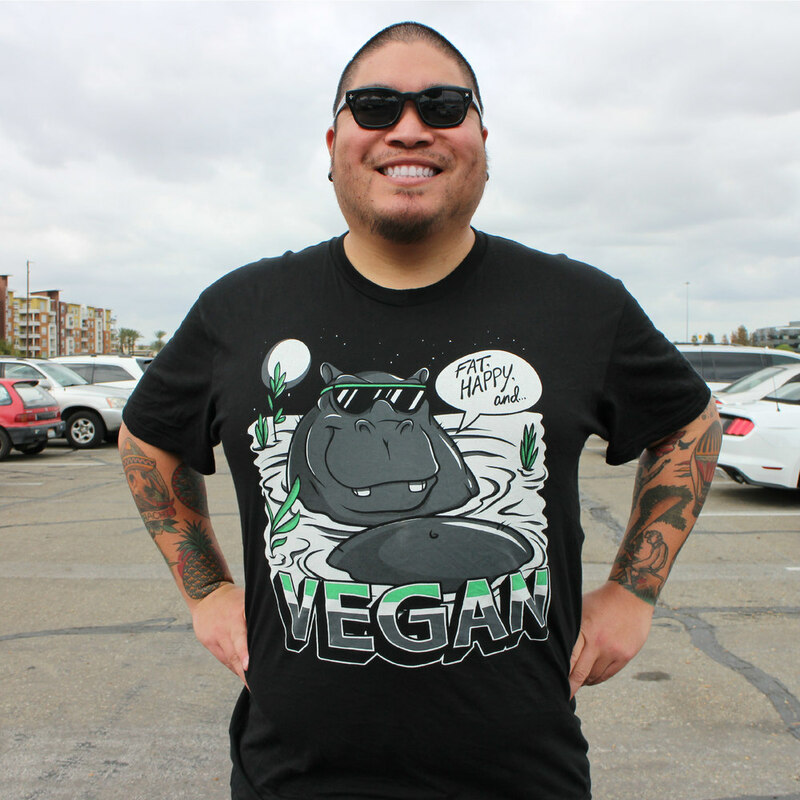 With his 'do it yourself' attitude, and resourceful nature, he started making his own t-shirts because he wanted them to have a certain feel, expressing messages about veganism, and to be made in a way which was as kind and ethical as possible. This led to him creating Compassion Co through which he designs t-shirts to fit all sorts of people whether they be feisty or not! What does Compassion Co specialise in selling? We specialise in creating organic or recycled, sweat shop free and USA made screen printed vegan apparel such as t shirts, sweat shirts, scarves, tank tops and more. Where is Compassion Co based? I am from Connecticut but I actually run the entire company out of my van, which is also where I live. For the past few years I've been on the road hitting as many VegFests around the country as possible. Eventually I got to the point where it just didn't make sense to be paying rent for a place that I was never staying. So in July of 2015 I gave up most of my possessions, purchased a Transit Connect and built a bed in the back. Aside from the 2x6 bed the rest is all storage space for my inventory. Where does one need to be to access your range of products? Since I'm not local to anywhere and have no brick and mortar location, the easiest way for someone to purchase is through my website. We ship worldwide. I also visit between 30 and 40 VegFests a year, which is a great way for people to try on shirts and feel the quality of the fabrics. After being vegan for a few years I was looking for t shirts that could help promote the vegan message and start conversations but I wasn't finding anything that fit my needs. Everything was either too passive or way too aggressive and none of them had interesting graphics to accompany the messages. Having toured in bands since my teenage years, I already knew artists and had a good friend who was a screen printer, so I had the infrastructure in place to start a t shirt company and with the DIY spirit of touring in a band, I figured I might as well just make the shirts I wanted myself. "Cruelty free" is a really loaded term and personally I never use it anymore. I don't believe there is really anything that can truly make that claim, even the vegetables we consume cause the death of animals and are often the result of human exploitation. With that said, when I first started the company I knew that I wanted to make sure that every step of production followed the vegan ethic as much as possible. For that reason I settled on making sure all our fabrics were either organic or recycled and were USA made sweat shop free. Within those two parameters my options for shirt suppliers were extremely limited, both for color options, as well as, styles. It was hard to find a t-shirt supplier that I felt comfortable with. Also, the original company I was using closed without notice roughly 2 years after I started the business, and I had to scramble around to find another supplier. Of course everything we produce is vegan, which isn't that hard to find since your average cotton shirt will be technically vegan, without animal products. All our screen printing is done with water based inks and thankfully all the printing is done by a long time friend who was able to walk me through the best options to make our printing as eco-friendly as possible. For someone who hasn't purchased your products before, is there one which is more popular than others? If you're not sure about what to buy, you'll be pleased to know that we feature a variety of messages, which vary in terms of how assertive they are. So ultimately, your choice will probably depend on what kind of person you are and what kind of conversations you want to start. 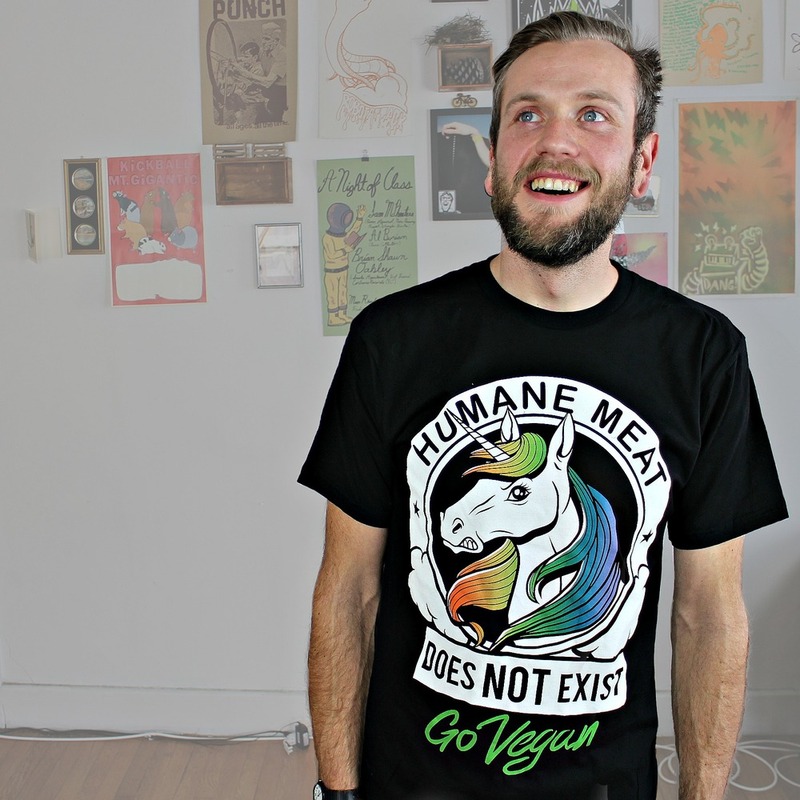 Saying that, our most popular design features a sassy unicorn that says "Humane Meat Does Not Exist, Go Vegan"
Is Compassion Co owned by, or in partnership with, another company that tests on animals or sells non-vegan products? Tell me a bit about yourself before you launched Compassion Co? I've been playing and touring in bands since I was in high school. At one point touring full time in the US, Canada and the UK. During this time I went vegetarian and then, 8 months later, vegan. After my main band dissolved I started touring with the 10 Billion Lives Tour, a project of FARM, that engages in "Pay Per View Activism" which means we pay folks $1 to watch a four minute video about the treatment of animals on farms. After they've finished watching it, we talk to them about the steps they can take to go vegan. I did several tours with them before the time demands of Compassion Co became too demanding and I chose to switch to running the company full time. What are your future goals for Compassion Co? Ultimately I hope to continue to prove that there is a sustainable model for offering ethically made clothing and use that success to help push others to pay more attention to the ethical concerns behind the clothing they are creating for their companies, non-profits and sanctuaries. Similarly to how veganism operates on the principals of supply and demand, as organisations and individual consumers start to support clothing that is in line with their ethics, we can do the same with clothing; making sweat shop free and organic garments more and more accessible. If you want to support this ethical company and kit out your wardrobe with some new t-shirts, you can save 10% if you're one of the first twenty people to use this code (PLANTSHIFT) when you checkout. Meet Paul and Dario who have created Give Kitchen through which they feed their customers and the homeless too!